DOWNLOAD "CMBR - mount and connect" as pdf document. CMBR may be mounted either by mechanical clamping or gluing. A mechanical clamping should be done with moderate force, as low as possible to avoid unwanted clamping and thus reduce the maximum stroke. Epoxy glues are well suited for gluing piezo ceramics and several alternatives exists. Please contact us if you need support on selection of appropriate glue for your application. 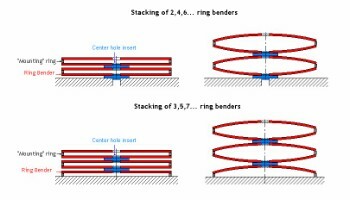 Mounting of ring benders at their outer diameters needs some flexibility at the contact line to avoid unwanted clamping that will reduce bender's efficiency. Therefore mechanical clamping should be done with moderate forces and if the ring is glued, a flexible epoxy should be used. 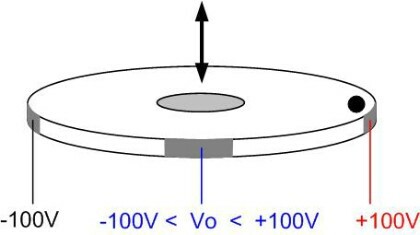 If 0in<100V, the ring will bend down with the black spot facing up. 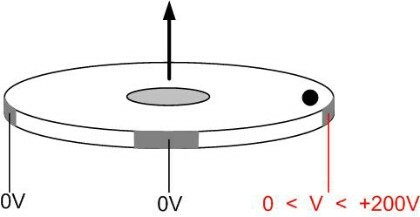 If –100Vin<0, the ring will bend up with the black spot facing up. Ring benders may be stacked to multiply performance by gluing on a “mounting ring” with non-conductive epoxy glue and put on top of each other using a special piece of aluminium inserted in the centre hole. The special piece of aluminium inserted in the centre hole is called “centre hole insert”. The mounting rings may be manufactured in aluminium, but other material such as ceramic for instance can be used.